Before my latest trip to London, about all I knew of Hammersmith was that it was a charming area outside of central London; and that former Top Gear presenter James May calls it home! So when I spent a day in Hammersmith this past April, there was lots for me to learn and plenty to discover. 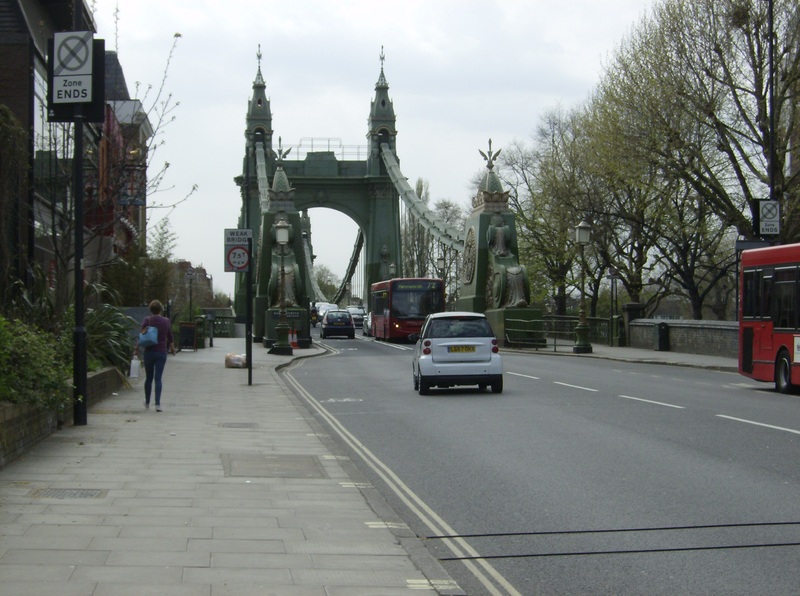 Hammersmith Bridge; one of London`s most unique bridges in my opinion! 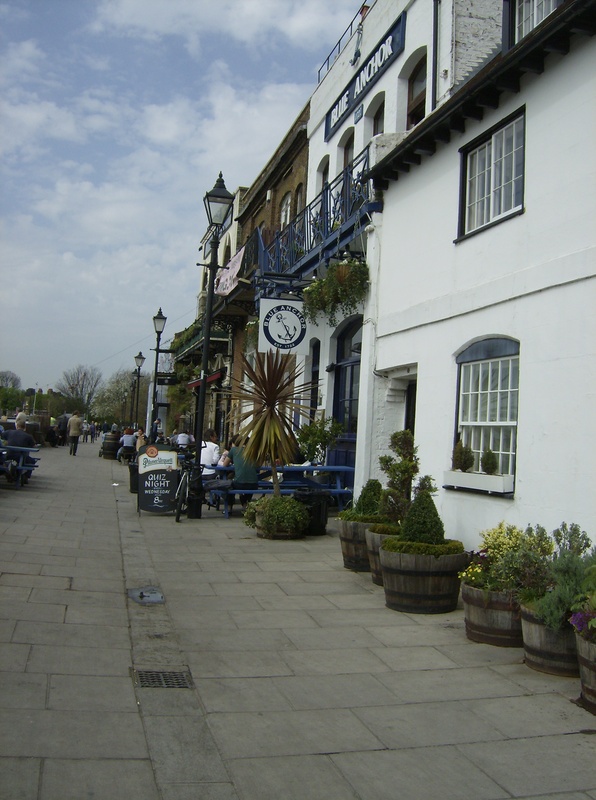 My mum and I ventured into Hammersmith mainly to visit a pub– making it a very worthy trip! The destination was The Dove, which is a riverside pub once frequented by writers such as Ernest Hemingway. The lyrics to one of my favourite patriotic songs, Rule Britannia, were also reputedly written at this very establishment! The Dove was a wonderful place. 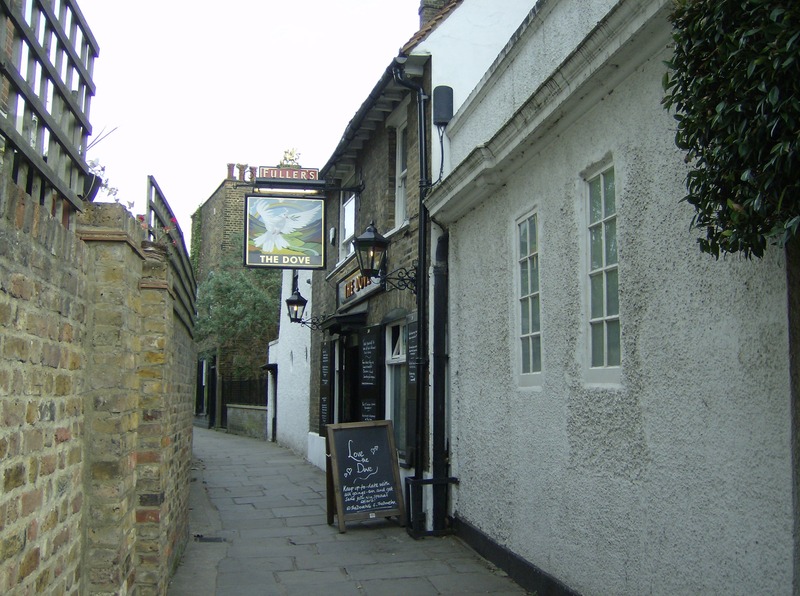 The atmosphere was welcoming and charming; dogs kept coming through the pub which is something one doesn`t see in central London, but which is in my mind the mark of a proper pub! Although the idea of allowing pet dogs in any kind of establishment where food is served is completely alien in Canada, I look forward to taking my dog on trips to the pub with me when I live in the UK someday! 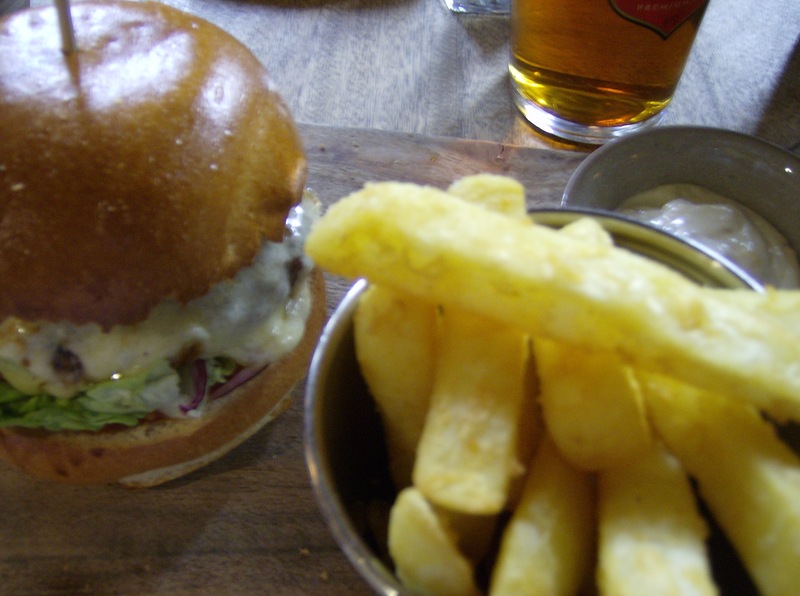 I can`t say enough good things about my meal at the Dove– I enjoyed the best hamburger I`ve ever had, washed down with a pint of Fuller`s London Pride and complemented by a heap of chips. It was fantastic. And the experience was livened up by the amusing young man who was our server– he was quite a character, and was interested in where we were from and where we were going. The combination of the amazing food, incredible history, and friendly atmosphere made the Dove somewhere I`m dying to visit again. 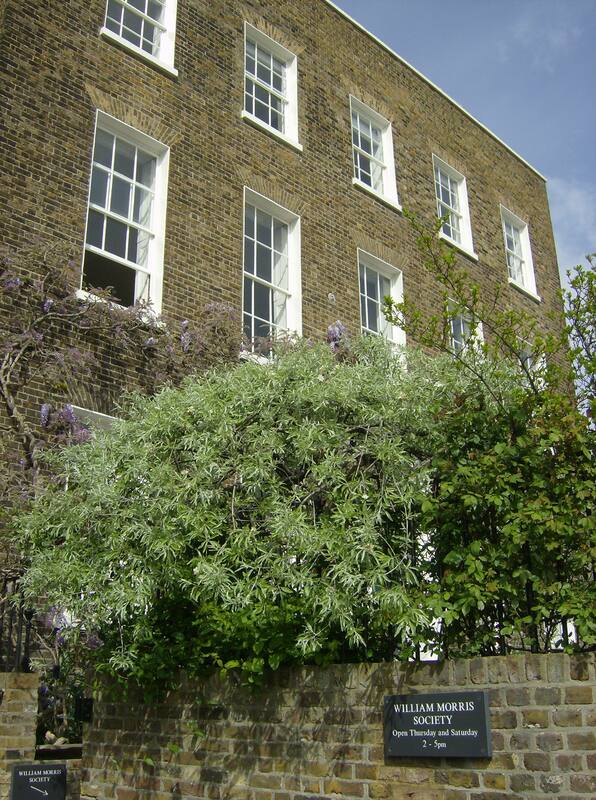 Once we had refueled at the Dove, we visited Kelmscott House; which is a museum dedicated to William Morris. 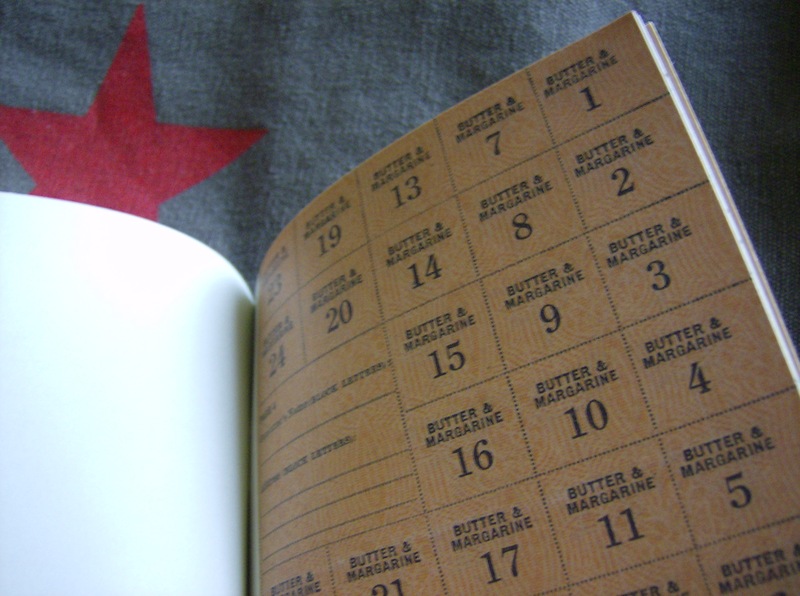 Morris was a textile designer, writer, and socialist who offered a fresh and unique approach to life amidst the excess of the Victorian era. 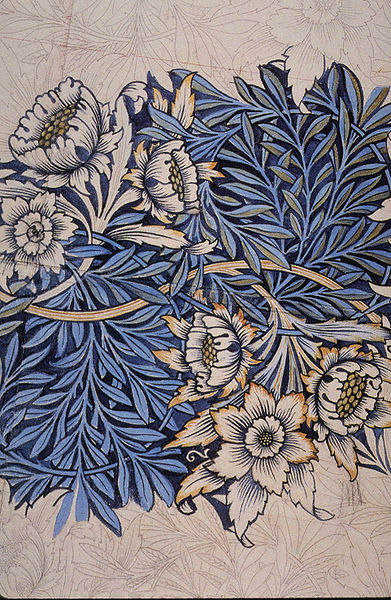 I`ve long adored Morris`s intricate yet natural designs (many of which were inspired by medieval art and the natural world), and many others do as well– Morris designs are still in production today, over a century after his death. 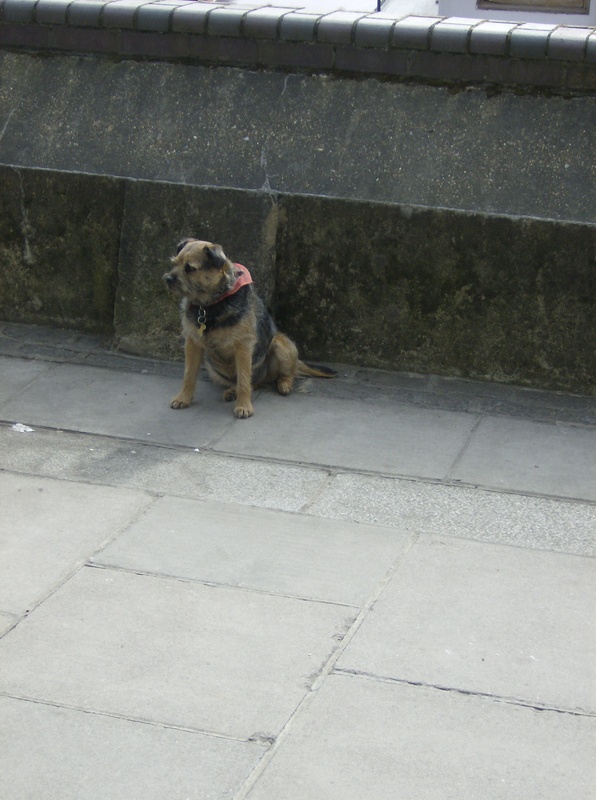 One of the most memorable sights of the whole trip was a small Border Terrier by the riverside in Hammersmith. He was sitting by the wall, across from a man who was presumably his owner, and who was reading a newspaper and not paying the slightest attention to the dog. About three feet from the dog (out of shot in my photograph) was a tennis ball; which wasn`t throwing itself and which was evidently irking the dog. This dog was in a snit; that`s the only way to describe it! He wasn`t concerned by any of the passers-by, and just sat grumpily by the wall for ages. It was most unusual and it really made me laugh! Riverside Hammersmith is a picturesque place, and it`s not terribly crowded either. I really enjoyed walking along the river and seeing all the boats, wildlife, and locals on what was a gorgeous spring day. 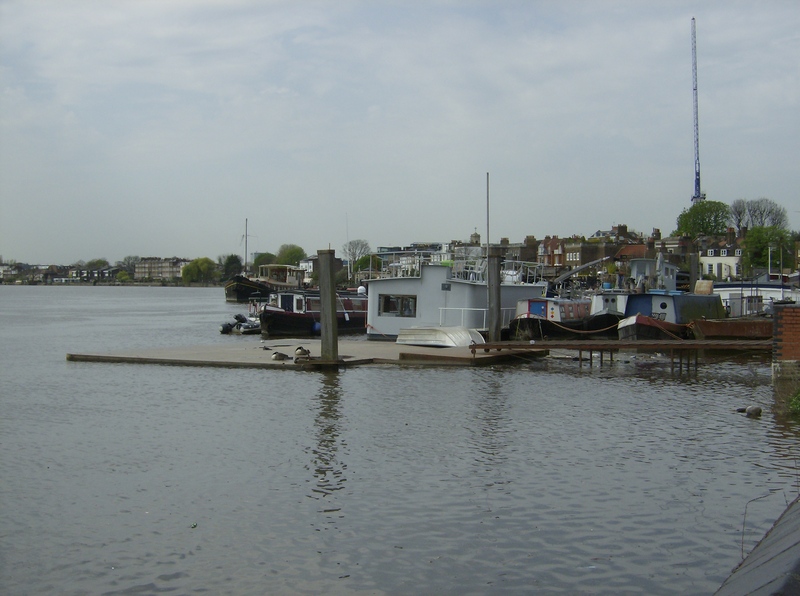 Hammersmith was a delight to visit; it`s so much quieter and closer to nature than central London. No wonder people like Hemingway, William Morris, and yes, James May, choose to spend time there! 74 years ago today, on an unassuming early summer morning, German bombs and artillery in Eastern Europe began the largest land invasion in history. To commemorate this sombre anniversary, I’m sharing a poem I wrote about 3-4 years ago– I hope that its words will speak for themselves, and illustrate the suffering and simultaneous resolve of the many Red Army soldiers who fought and died on this day and the days following in 1941. The sparkling streams mix and play in the fields near Rostov. They do not see, or remember not the Death brought to the Motherland. Death’s cold voice calls to me, and I cannot change it. The shriek of rockets though the air, and human cries above these sounds. Overthrown by this dark enemy– Stolen, despite its courageous sons. We have fought hard, my friends and I; but we see our lives in vain! All we can do is fight with pride, and defend with only death to gain. But this is my final hour, my vibrant years went far too fast. The future I had did not betray that I would falter in my youth. But gratification does not come, and our borders fall to the enemy. So far from all that is dear to me; and as I lie fallen, I cry. I know she is waiting for me still– I thought I could endure this hell. My days with Katya seem a blur in my darkening mind. But now I see the end is near and I will never return home. In it I feel peace and the presence of those who fail not, and will see our cause won. Though a place in the sky, my Katya would say, awaits those true and meek who believe. I feel not the pain nor the loss of the fight, and am being raised up towards a new door. And realize as I am pulled through the gate the truth that before I did not know. Katya waves, and the door is sealed, giving me victory and the end of the fight. Few images are as enduring or distinctive as that of Rosie the Riveter. 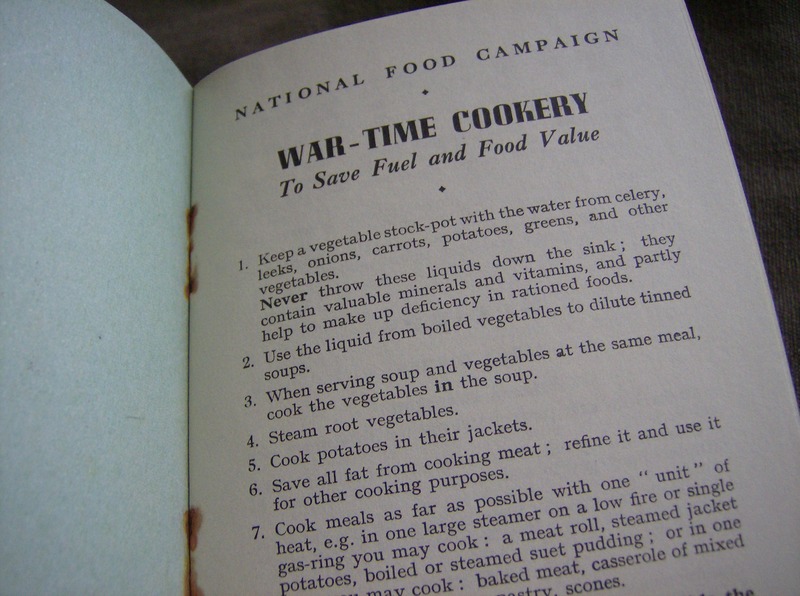 This no-nonsense woman in overalls became a symbol of resourcefulness and the wartime spirit; and continues to evoke these things today. And since Rosie the Riveter is such a classic, I decided to share an outfit inspired by her today! The foundation of this outfit is the Yves Saint Laurent jumpsuit; in a tailored ’40s style, it mimics the overalls worn by countless women in factories and shipyards during the wartime years. But this outfit takes on a shade of glamour through its burgundy crocodile heels, embossed handbag, and ladylike jewellery. Tortoiseshell-effect sunglasses and a classic scarf in bright, hopeful colours give a final dose of ’40s flair to this wearable and timeless look! Shopping always seems to be a popular pastime for people on vacation. And it was certainly enjoyable for me on my last trip to London– I relished the chance to visit high street shops and department stores like Marks and Spencer, to see what kinds of fashion and jewellery they were offering. And what I found was to my taste; I came away with a few new tops plus a pleated olive drab skirt and some jeans! But even those delightful articles of clothing pale in comparison to my other finds. I’m always on the lookout for antiques and especially military artifacts when I’m out and about. 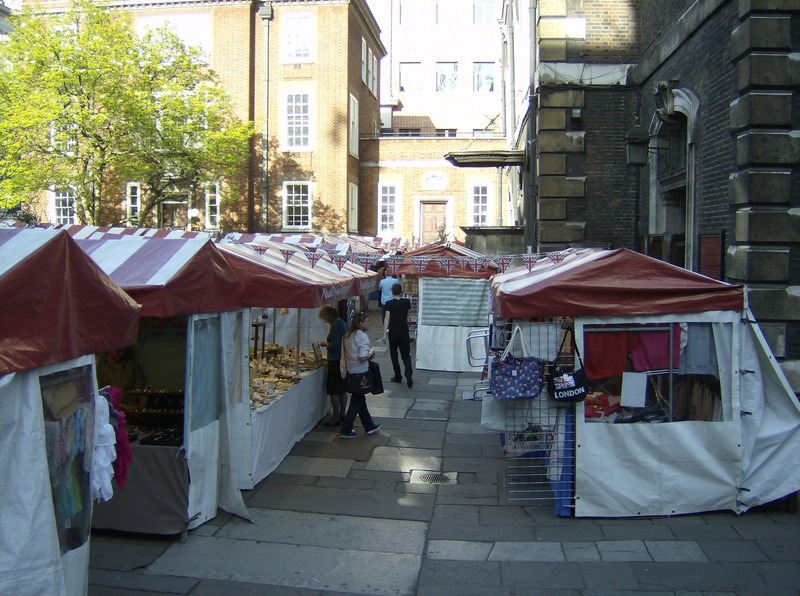 Markets are always good places to start, and London abounds with them! I came across the Piccadilly Market outside St. James Piccadilly, and it soon became apparent that it was fortunate I did! The market had crafts, antiques, knick-knacks, and souvenirs. And some lovely Union flag bunting! I quickly looked around most of the stalls, only pausing at the antique ones. 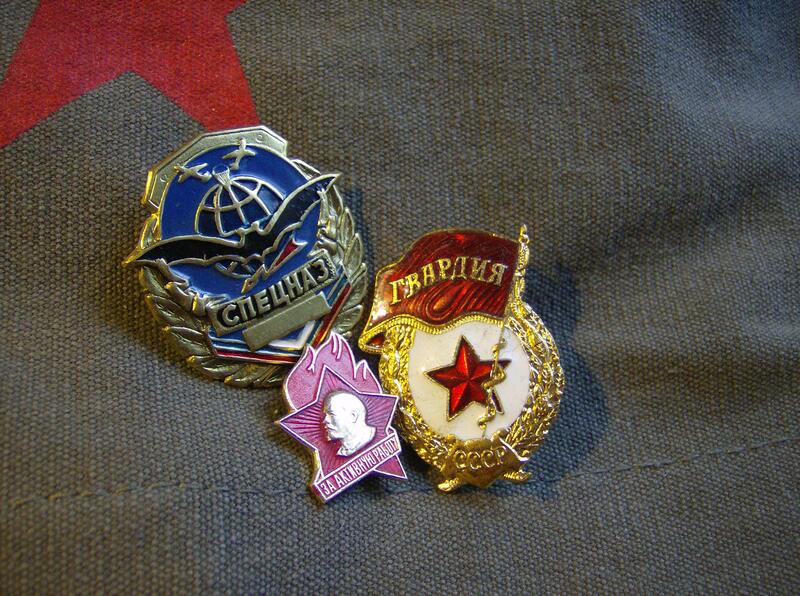 But there was something even more fantastic than antiques at this market– there was a stall selling Russian things, including an enormous array of genuine military badges and pins! I couldn’t believe my luck. At home I always hope to find some sort of old Soviet military artifacts at garage sales or surplus stores, but there never seems to be anything. So this was incredible, and just looking at all of the pins was one of the highlights of my trip! I love books, and these ones are just enthralling! 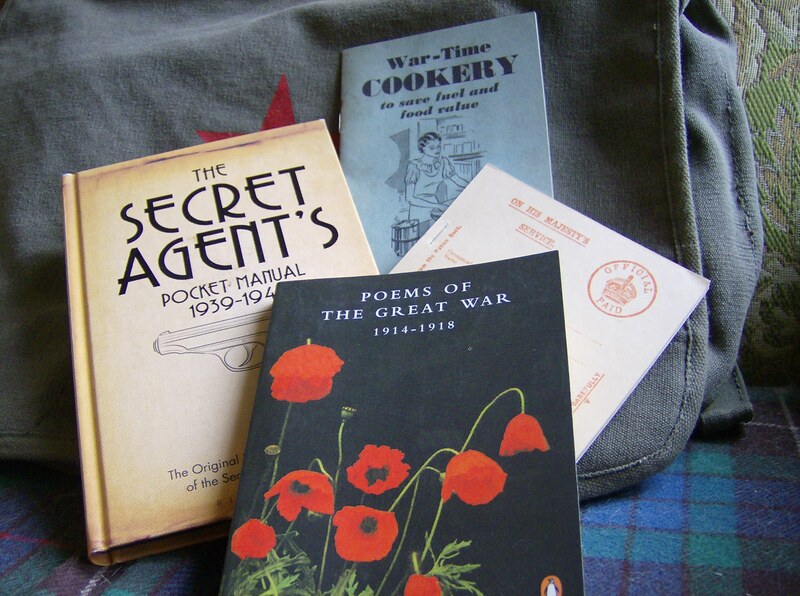 Frugal cooking, war poetry, and a secret agent’s manual: what more does a WWII aficionado need? 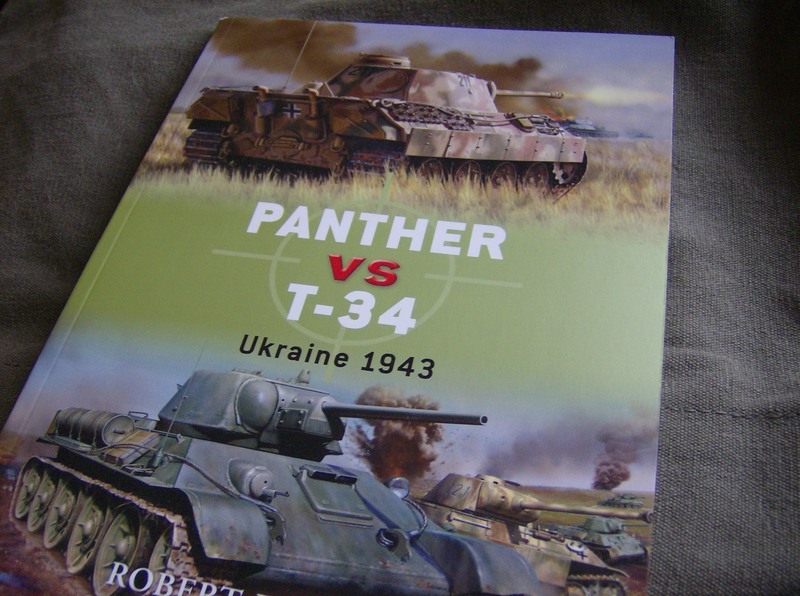 This is full of facts about two brilliant tanks, which I can’t wait to memorize! A lot of these tips would be good to remember today, given our consumer culture! Kitschy souvenirs never do much for me– when I go somewhere, I want to bring back something that has a story and that will make me remember it. 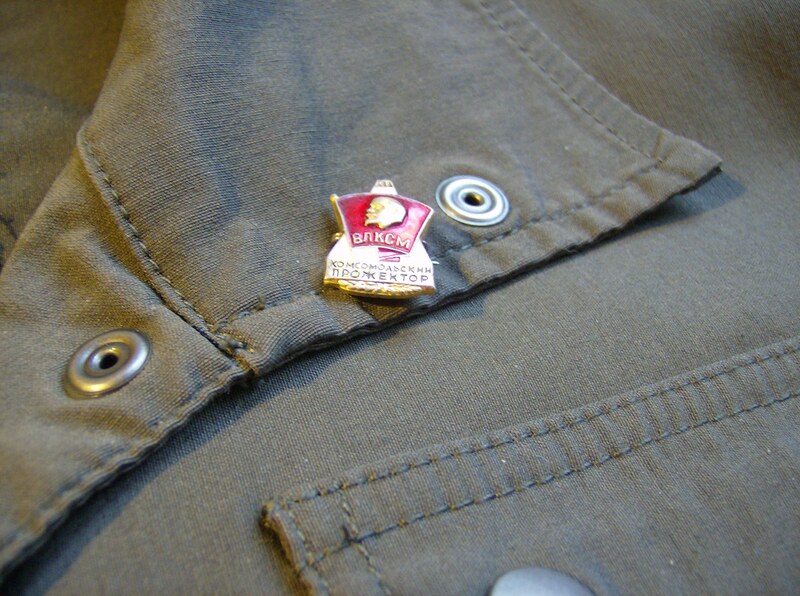 That’s why even though, for example, my military pins have nothing to do with London, I know I’ll always link them with this trip. I was so fortunate to find the awesome things I did, and I value them considerably more than I would an “I Love London” T-shirt or a Big Ben keychain!! I could not be more happy about my London hoard! Summer is here, and that means days of relaxation at the park or the beach! Even in the dark days of the 1940s, when war enveloped Europe and the rest of the world, people made the most of these simple pleasures. This outfit follows that spirit, and is something I would be only too happy to wear! Nautical is the way to go when it comes to a beach outfit– it’s classic and appealing, and was popular in the ’40s. And in that vein, this ensemble delivers! A blue and white striped top paired with tailored sailor shorts creates a fun base for the practical straw accessories. Strappy leather sandals satisfy both today’s trends and the fads of the ’40s; making this look from the past also relatable in the present day. Glittering gold jewellery and red lipstick add an extra level of sophistication, and ensure that this beach look will stand out! I’ve been to many parts of London, but there are always some areas left to discover. This past April I made my first real foray into Holborn, which is a bustling yet historical area in central London. My main reason for visiting there was to tour Sir John Soane’s museum, but even as I walked to and from the museum there were many wonderful things to see. Visiting the museum was a very unusual experience. Unfortunately (yet understandably due to the rarity and age of many of the artifacts), photography inside is prohibited; so I’ll have to do my best to describe the atmosphere. The rooms which had classical statues and stonework hanging from the walls can hardly be described– it was like being in a mismatched, haphazard cathedral full of gargoyles and figures from every culture and time period imaginable. 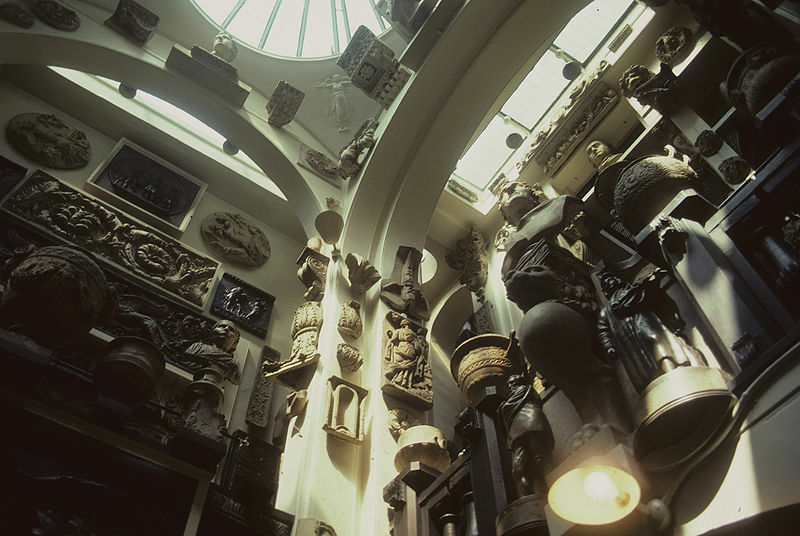 Apparently, John Soane began his magnificent collection to benefit contemporary students of architecture. He allowed them to visit his house and study all the artifacts he had acquired; and I wish I’d had the time to spend hours there scrutinizing the collection as they would have done! I appreciated the more livable rooms of the house just as much. It was fascinating to see Georgian-era decorations, and to imagine the way in which people of this era (one of my favourites) lived. The breakfast room was especially memorable– it wasn’t enormous, but it incorporated mirrors in almost every corner in order to maximize the light and illusion of space. 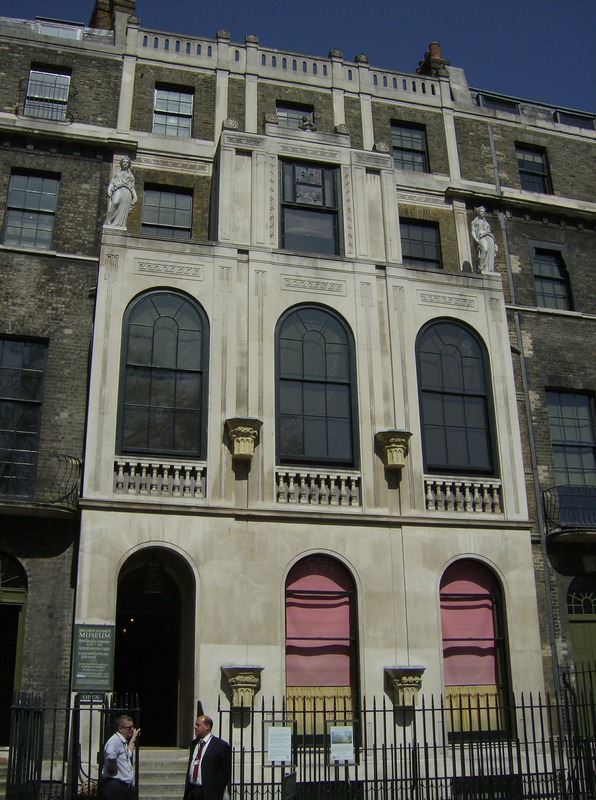 Sir John Soane was without doubt a very talented man, and touring his house and seeing his legacy were privileges I won’t soon forget. 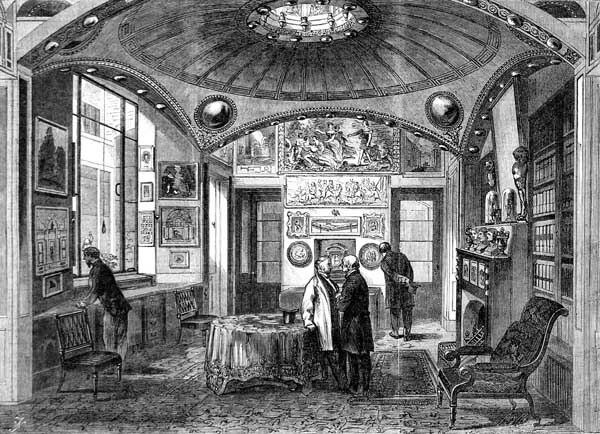 A drawing of the breakfast room in Sir John Soane’s house, seen in the “Illustrated London News” in 1864. Image from Wikimedia Commons, public domain. After the magnificent experience of Sir John Soane’s museum, I saw a similarly magnificent motor on the street outside. 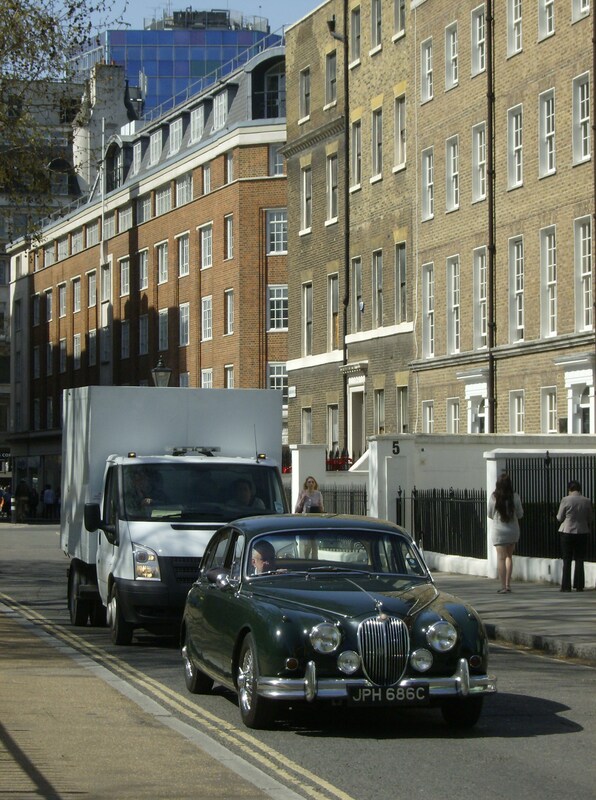 There were plenty of old cars about in London, but in Holborn I was fortunate enough to see one of my dream cars– a Jaguar Mark 2. In addition to being a piece of British motoring history, this model was British racing green– my favourite automotive colour! Next up was a walk along High Holborn– having never been there before, we were a bit disoriented and only came round once a lovely local lady stopped to help us find our way! I noticed on this trip more than ever, that people were surprisingly kind and friendly. Whether it was a clerk at the supermarket or, in this case, a local on her lunch break, people were happy to take the time to talk and help out. That’s not to say that every other person on the street said hello to us– but every now and again, someone showed us some sort of generosity, which is often hard to find in such a big and busy city! 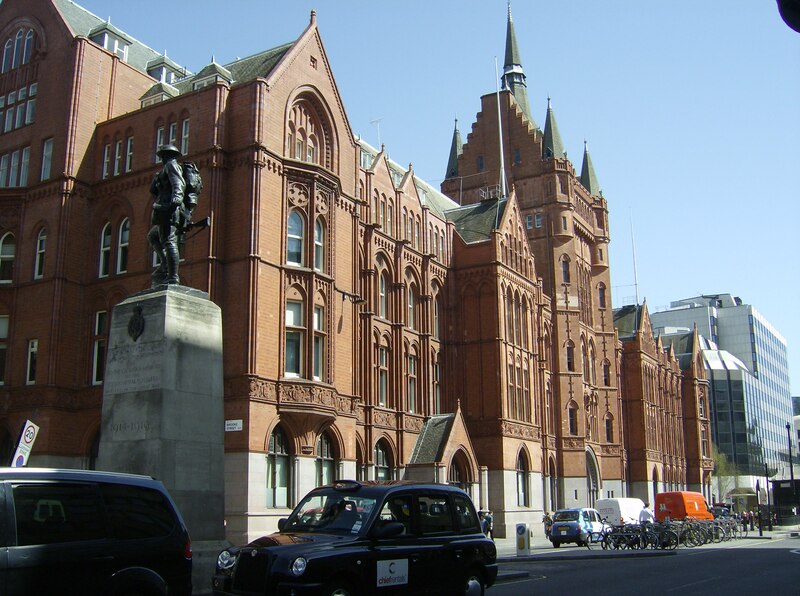 Holborn Bars, also called the Prudential Assurance building. A very Victorian structure! 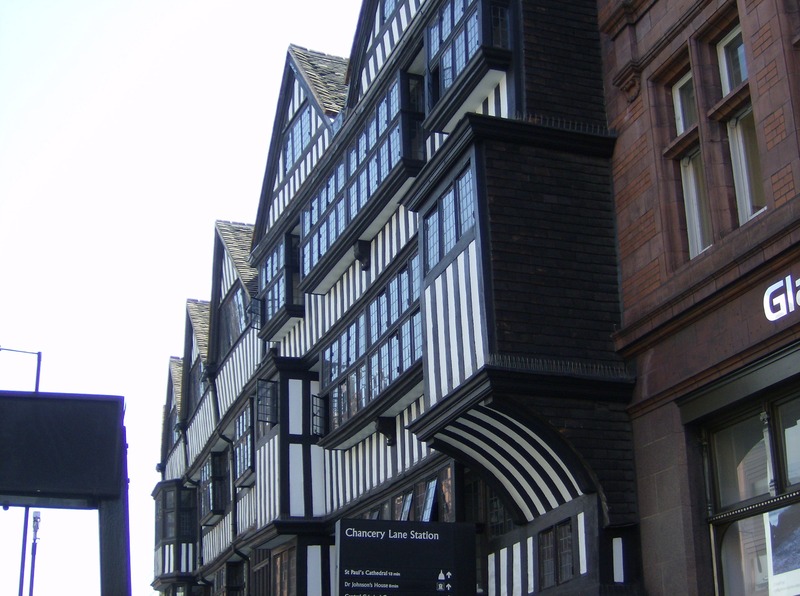 High Holborn was a busy street, but it also had some charm. The Staple Inn was a very picturesque place (it reminded me of Lavenham, a half-timbered mecca in Suffolk), and there were pubs every few hundred feet which are always a comforting sight to lost tourists! 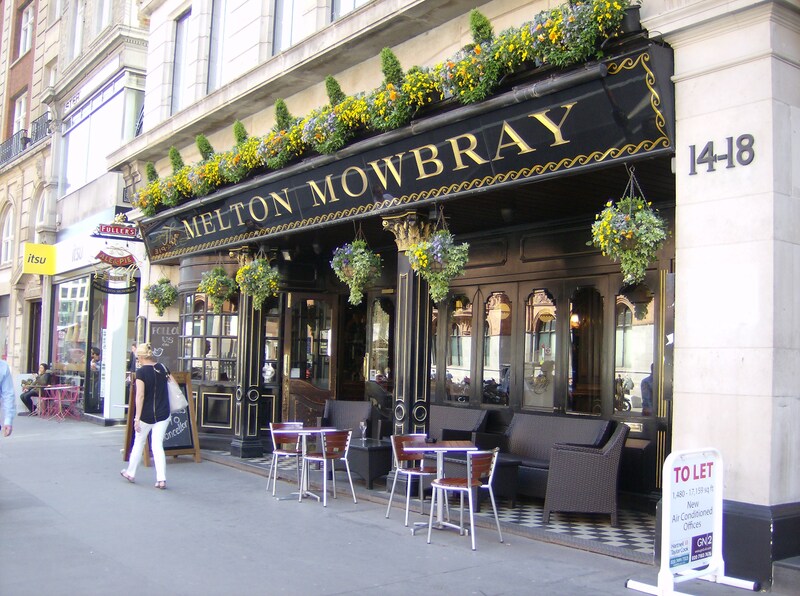 We didn’t go in, but this was a lovely-looking pub! 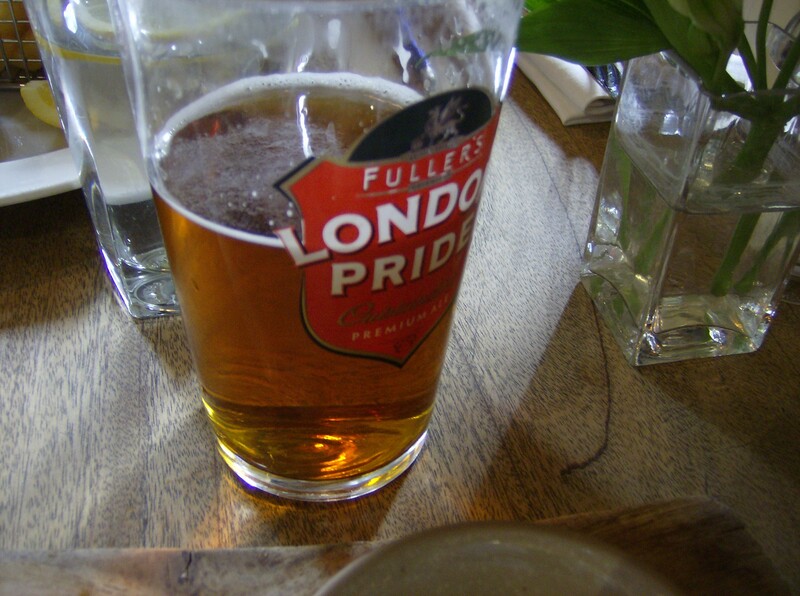 It was a Fuller’s pub, and it carried the name of one of my favourite foods ever– what could be more wonderful? 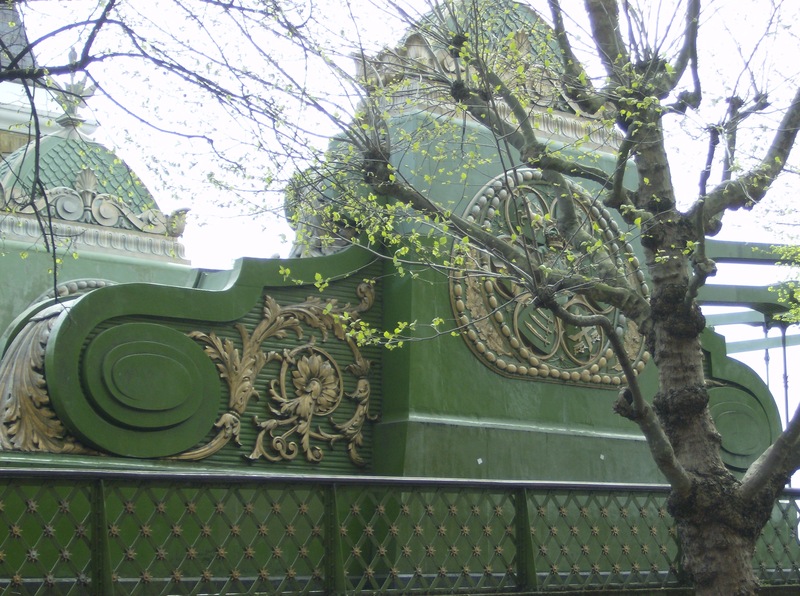 We eventually did find our way out of Holborn and to Smithfield Market– but that’s a story for another day. Even though we spent much of our time in this area wandering about and feeling lost, we saw so much and enjoyed ourselves immensely. It really proved that the joy is in the journey, not only the destination!